Lieutenant General (Ret’d) Sir John Kiszely KCB MC DL will discuss the failed 1940 British campaign in Norway and what can be learned from it in the modern age. The British campaign in Norway in 1940 was an ignominious and abject failure. It is perhaps best known as the fiasco which directly led to the fall of Prime Minister Neville Chamberlain and his replacement by Winston Churchill. 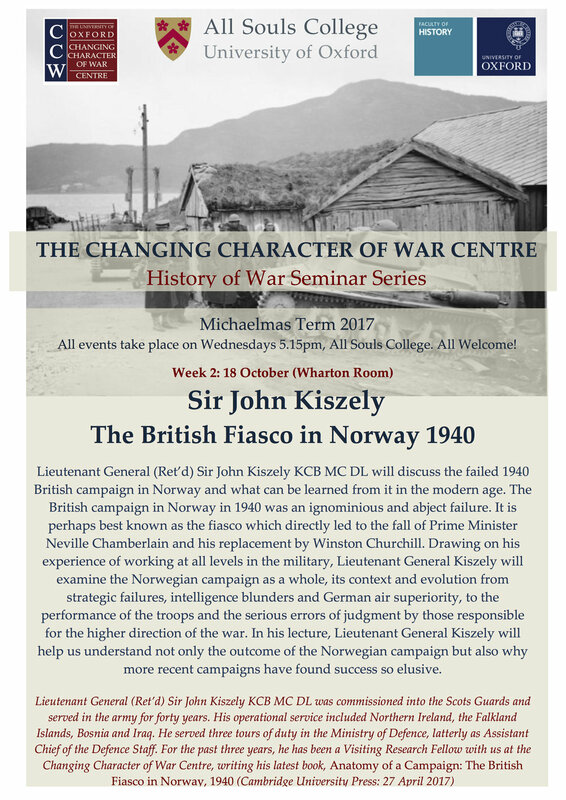 Drawing on his experience of working at all levels in the military, Lieutenant General Kiszely will examine the Norwegian campaign as a whole, its context and evolution from strategic failures, intelligence blunders and German air superiority, to the performance of the troops and the serious errors of judgment by those responsible for the higher direction of the war. In his lecture, Lieutenant General Kiszely will help us understand not only the outcome of the Norwegian campaign but also why more recent campaigns have found success so elusive.